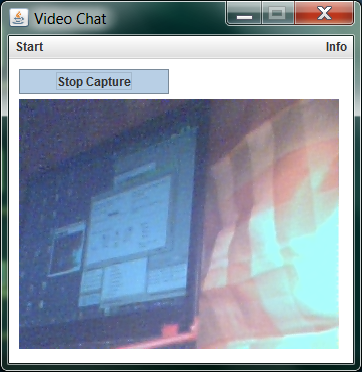 I developed my own video chat using JMF as base for transmitting and receiving RTP data over a network. You don't need to install the JMF as the Jar comes as full package including all dependent librarys. All found devices are displayed in this screen. 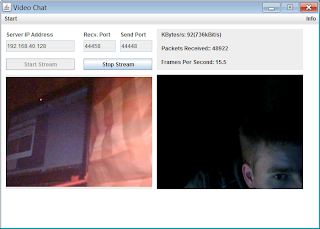 Network mode on the host side. Right picture is the local and left is the remote one. Network mode on the Vm Client side. Same as above. Solution: Try a few times to "Query Devices"
I'm trying to run your application using a Dell Studio 14/1485 Laptop with Windows 7 64 bits and JRE 1.6.0_01, but when I try to Query Devices the system show the message: "Exception on commit = java.io.IOException: Can't find registry file"
this may be an Issue with the Java Media Framework which was used to accomplish the video chat. Can you please share the source code of this video chat application. I have problems with the video, can you tell how to make the video part? 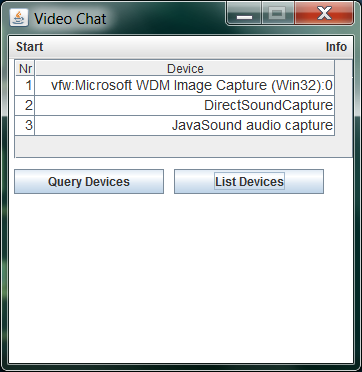 i already have a chat with java, but i am lost about the video... i appreciate any help, your program is awesome. When i execute ur(project)executable jar, i get error msg "de.boehme.app.videochat.exception.UnsupportedJVMException: You have to run this program with a 32 Bit JVM and not 64 Bit! ...will close in 3 seconds!" --But my OS is window7 64 bit and jvm is 32 bit.